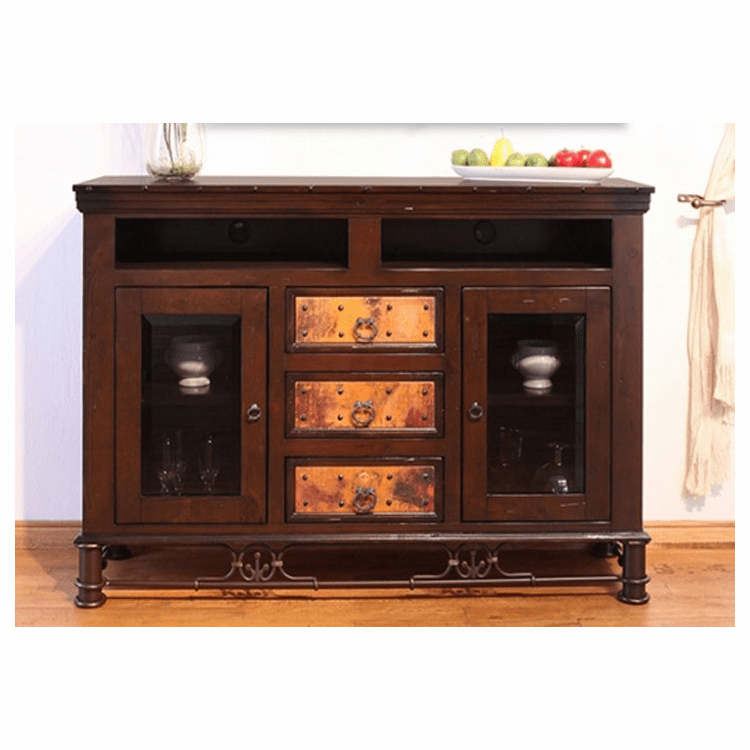 This beautiful and unique rustic TV stand will look great in your home from our copper furniture collection. Features include made from 100% pine wood and has a multi step lacquer finish to enhance the old world look and wood protection. The center drawer panels are real hand hammered copper and are lacquered to protect the copper. The drawers feature front dove-tail joinery and ball bearing glides for a durable and smooth drawer. This TV stand features 2 top open shelf for your cable or DVD boxes with wire management holes. Two side glass cabinet doors, when open is reveals a removable shelf and 3 center drawers. The decorative wrought iron metal stand completes this beautiful and functional TV stand. Comes already assembled in one piece. Color: Wood Dark-Chocolate, Wrought Iron Base-Brown.